Make a dough out of flour, butter, sugar, cacao and egg yolk and put in the fridge for one hour. 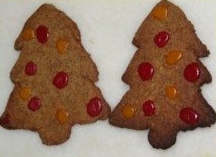 Roll the dough out and cut out Christmas trees by hand or with the help of a cardboard model or a cookie-form. Bake 12-15 minutes at 180 degrees Celsius. Cool down for one hour. Make two colors of icing with the icing sugar and food coloring. Dip in a tip of a knife and make Christmas decorations in the tree. Mix all the ingredients except the food coloring, divide the dough in two and add a few drops of red to the one and green to the other half. Make lines of green on a baking tray, using a pastry bag, and consequently adjacent lines of red. Bake 10 minutes at 180 degrees Celsius. 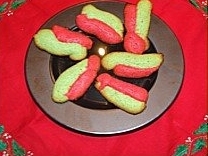 The Worldcook site has also a page for Christmas cookies.